I love this layout! Great way to document your "stuff". Oh, I love the Harvest Lane collection! Looks like you have some pretty decorations for fall. Gorgeous candle. Great idea to put this on a page. 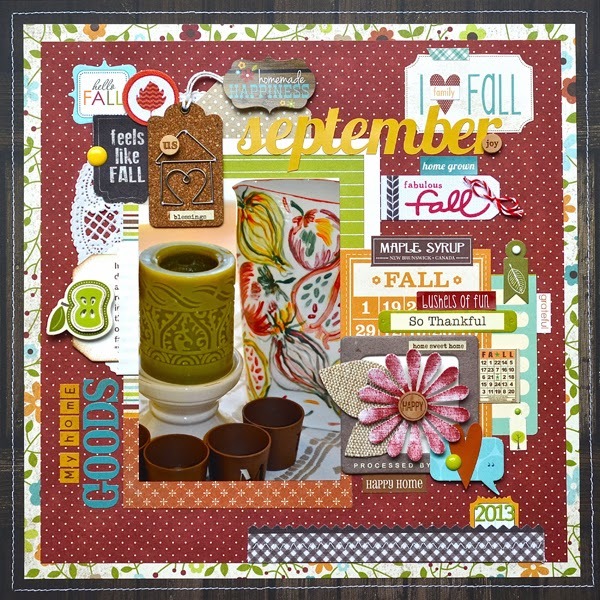 Such a cute layout, the textured items were a great complement to your page! Wowwwwwwwww! This is gorgeous!!!! Your colors are similar to mine!!! I love love love that flower and the cork tag!!!! sooo loving all the color and pattern on this one! What a great page! Love all the fun stuff and the textures. Yum! I love seeing home deco photos and you've made a perfect fall layout with this one! Love your mom's pitcher and your layout!! What a great idea to scrap a page about your favorite home decor! Have to remember that! LOVE your page with all the details! There's always so much to see on your layouts, love that! I absolutely adore this! I'm always amazed how you take all these bits and embellishments and put them together so perfectly. Like a puzzle, if you will. It's so fun just to sit and look at all the little bits. Beautiful job! Lovely layout. You did a great job using these embellishments. Great page! I love how you get so many fun elements on there!! Sounds like a fun weekend! I've never done a page about my home decor, but I really should, in fact I just need to scrap about me more! 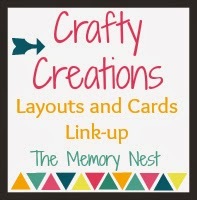 So much layered goodness on your page, Lisa! Beautiful page Lisa and I love that these are your year round decorations!! Our home also has a Fall color scheme for home decor all year round!! Your layout is beautiful. Fall is my favorite time of the year. Great layout! I"ve done layouts about the ornaments that my mom has made over the years that adorn my tree but not just a daily decor piece. Lisa another beautiful layout. I love all the details. Thank you for sharing your Crafty Creation at tMN. We hope you will share with us again on the 28th!